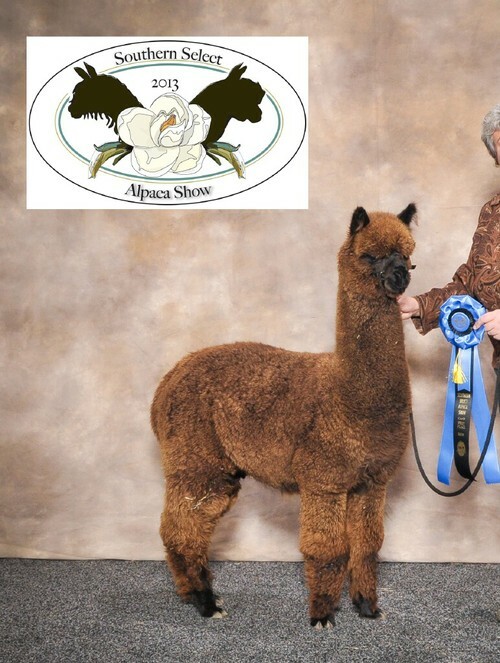 Challenger is the half accoyo, bay black son of CPeruvian Accoyo Express and SA Peruvian Black Mysteria. Born on Hickory Ridge Farm in July of 2007, he showed excellent fiber and conformational characteristics from the time he landed on the ground. The fiber’s extreme density and softness of handle are two of his qualities that set him apart from the rest of the crowd. The high frequency crimp and thick fiber density allows for the formation of a lock structure that rivals the very best of full Accoyo white animals. When Challenger walks into the ring, his outstanding conformation gives the impression that he is there to own the ring. Challenger is the epitome of the typey black herdsire genetics that you will want to carry into your herd. 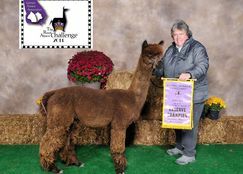 Challenger will bring a highly sought after fleece and great genetics to his offspring. We are sure he will be another solid herdsire that the best breeders will want to utilize long term. Challenger's juvenile show record is outstanding with six blue ribbons and four championship banners!! And he was only in six shows. His 2008 show season has finished with a bang. After appearing in 14 Halter shows, he has received fifteen blue ribbons and eleven halter class championship banners The blue ribbons include Best Male Yearling Bred and Owned. 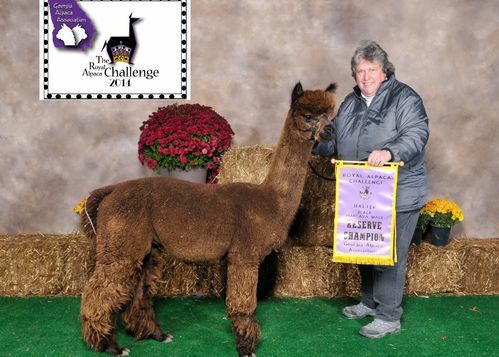 The championship banners include a reserve championship at the 2008 MAPACA Jubilee, which to date has been the largest Alpaca show in the world!! At the 2008 Empire Extravoganza, Challenger was selected as the first ever Judge's Choice Male Huacaya Award! The awards continue in 2010 with even more championships, making the career total 21 halter championships!! 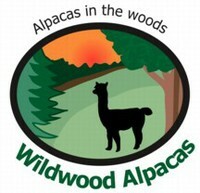 Challengers skin biopsy came back at 88.75 folicles putting him in the top three alpacas!! Challenger cria are now on the ground. True black to grey. Ten of Challenger's crias have Color Championships. Sired by Hall of Fame Herdsire Dom Lucilio, Luc's Baroness is a bay black female with highly crimped, dense fleece and excellent coverage. She is gentle and sweet, an easy keeper. Best of all, she has given us two black female crias in a row; it doesn't get any better than that! 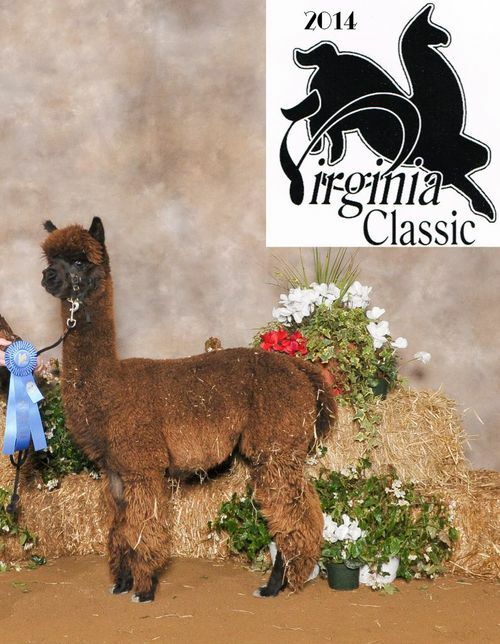 Baroness delivered a lustrous, black female cria in June 2007 sired by Double "O" Good's black color champion, Dark Knight. In 2008 she delivered a gorgeous black female sired by Double "O" Good's Act II Knight Rider. 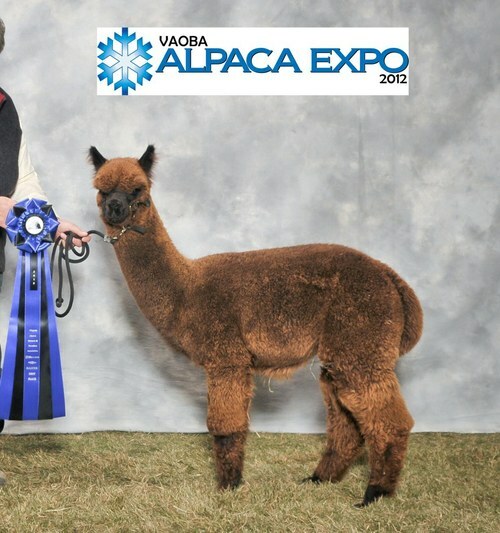 We repeated that breeding and were rewarded by a shiny black male cria in 2010. Her 2012 cria is Marquis and he is destined to be a little champion. "Nessie" is making major upgrades to our herd all by herself.